My site looks fairly similar to the last time that I visited, although it now has over a foot of snow as opposed to just a dusting. Unfortunately it snowed the night before I visited, so many of the tracks I encountered were not very clear. The majority of tracks on my site seemed to be from White-tailed deer. 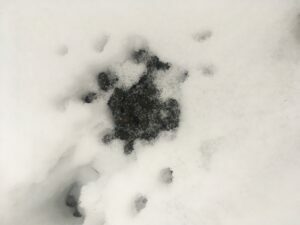 They were in a diagonal walking pattern, and I was able to make out the slightest hint of a hoof mark in some of the tracks despite all the new snow that had fallen on them. However, I was unsure until I encountered a pile of deer droppings right in the middle of the the tracks, thus confirming my suspicions. 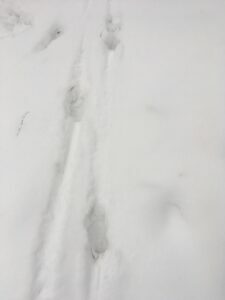 The snow is so deep that it almost seemed as though the deer could not lift its feet totally above the snow, so there were dragging marks between each print. 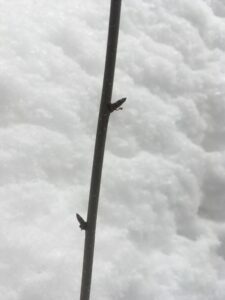 I encountered many Yellow Birch twigs with buds on them. 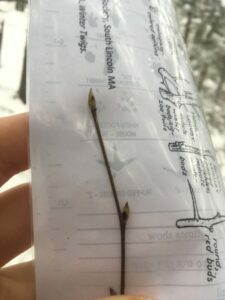 I’m pretty sure I found a very young Paper Birch with buds although I’m not positive. 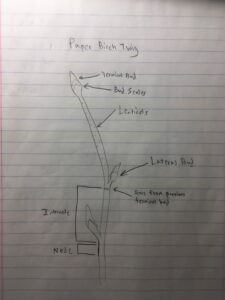 There are some Sugar Maples on my site, but I could not find any twigs because of how tall they are.